What is a portable fence? Portable fence is a series fence system. The portable fence is mostly made of high quality steel wire and pipe, and the special type is made of PVC material. Portable fence is a more practical system than the permanent fences. The main feature of the portable fence is movable. It can be easily assembled and dismantled. It can also be used for many times and for different demands. Portable fence protects public safety and security, can act as a protective site security measure when storing equipment and is also be utilized in crowd control, public restriction, traffic containment and venue division at special public outdoor events. What types of portable fence can we supply? Welded portable fence. It is made of welded wire infill and steel pipe frame. The wires are 360 degree welded onto the frame. It can assure the strength and durability. The typical types are Australia portable fence and Canada portable fence. Another special type of the welded portable fence is the anti-climb portable fence, which has closer spacing between the wires and let the intruders or thefts impossible enter the sites. 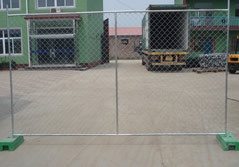 We can supply various types of portable fence. Chain link portable fence. 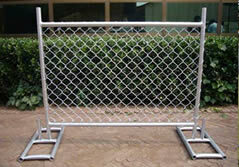 Chain link portable fence is more economical than the welded portable fence. There is no welded point on the fence panel, and the infilled woven wire mesh is fastened to the frame by lacing wire. The infilled woven wire mesh can be replaced when it is broken. Crowd control barrier. Crowd control barrier is made of high quality steel pipe. It has fixed feet and detachable feet. It is widely used in the high traffic street and large scare event to control crowd and protect security of the pedestrians. Portable fence gate. Portable fence gate can be divided into vehicle portable fence gate and pedestrian portable fence gate. It is designed for access for the vehicles and pedestrians. The design which separate the entrance of the vehicle and pedestrian can reduce the accident caused by the vehicle and pedestrian. Besides, it can also keep the normal order and improve the efficiency. Portable pool fence. As we all know, it is essential to set up the portable fence when there is a new pool construction or renovating. 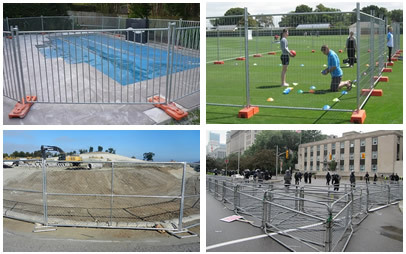 Portable pool fence can guard the site safety until the construction ended. It has the special self-closing gate, high fence panel, small spacing of the vertical bars, short distance between the bottom line to the ground. All of these designs can assure the safety of the children. Event portable fence. Event portable fence are made of high quality PVC materials, which has excellent resistance to the UV rays, and it will not be rot and corrosive. It has white colors and four different types of panels, which can let the fence more attractive and practical. Stage barrier. Stage barrier is designed for the large scale public events, such as the concert, festival. It can protect people from crowd hazard and it can supply the safety space for the workers, security and medical personnels. Police barrier. Police barrier is ideal for the barriers in the demonstrations and protests activities. The unique back triangulated base design can supply the extra stability to the barrier. It can be folded to the flat panel, which is convenient for transport. The interlock system can prevent the barrier from removing in the middle position. Why we need portable fence? Easy to install and remove. The structure of the portable fence is simple, it can be installed and removed quickly without any tools. Convenient to transport. The fence panel is separated with the base feet, which is convenient to transport. Corrosion and rust resistance. The portable fence can be hot dipped galvanized and powder coated, both of the surface treatment are corrosion and rust resistance. Economical. Compared with permanent fences, the portable fence can be used in many times and for many usage, it is absolutely value for money. Various type for choice. No matter you want to used in construction sites, residences, swimming pools or you need for events, concerts or public festivals, the portable fence can fit your requirements. Various accessories for choice. Stays & bracings, shade cloth, handrails, dog bars, barbed wire and other practical accessories for choice. they can make the portable fence more useful and can cater different customers. Attractive. 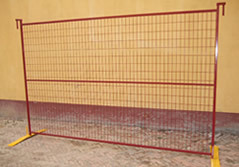 The portable fence can be powder coated, which various colors are available. It can make the portable fence more attractive and you can choose the colors to suit for your desired. Safe. All of the barriers are made of environmentally materials, there is no sharp edges, debris and other component which may hurt people. There are many thoughtful designs to protect the ensure the security of people, such as the anti-slip footboard and front board on the stage barrier, handrails on the welded portable fences. When do we usually use portable fence? It you want to hold a party outside your home and it is open, you may need the portable fence to make sure that your visitors are safe from possible strangers or thieves. 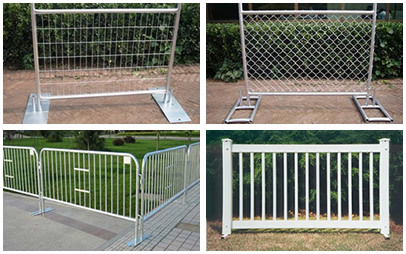 Portable fence has various applications, you can choose the perfect one for you. When there is a concert, festival or other public event where there are lots of people in the open air, you may need the portable fence to protect the safety of performers, workers and audience. 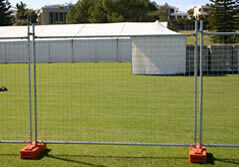 Besides, the portable fence can help to keep order to prevent the crowd accidents. If there are demonstrations or protests on the street, the portable fence can help police to keep order and prevent accident caused by the demonstrators and protesters. In a new swimming pool construction or renovating, you should set up the portable fence to protect the security of the children and the site until the construction ended. In the construction sites, the portable fence can guard the security of the equipment and workers, also it can prevent the unauthorized persons from entering the sites. On the high traffic street, you can use the portable fence to separate the vehicle way from walkway and reduce the possibility of the traffic accidents. In the football match, or other event the violence incident may occur, you can choose the portable fence to preserve order and secure the match security. In the entrance of the sites, you can use the portable fence to separate the access for the vehicles and pedestrians, so that the entrance will be clear and safe. Portable fence can be used as a protective fence and to strengthen security systems in railway, airports, highway, stadiums and other public places. For your private residences, the portable fence has the anti-climb type to protect property from unwanted trespassers and to secure a site perimeter. When there is emergency disasters, portable fence can help to evacuate people efficiently and protect the security of people. welded portable fence with corrosion and rust resistance, various colors and high strength features is widely used to secure safety of people and sites. Chain link portable fence with corrosion and rust resistance features is widely used in the public events and construction sites. Australia portable fence with welded or chain link panels and other useful accessories supply the full protection for the construction sites. Canada portable fence with the top coupler and the base feet supply the high strength and durability for the construction sites and factories.